or: Ya know...just one of my favourite movies. One word to sum it up: Brain-frying. Ask anyone who knows me, I absolutely adore Christopher Nolan. He is not only my favourite director of all time (three of his movies are in my top 5 favourite films), but he’s also the man who I aspire to be. With good reason, too. The guy is amazing. Not only did he burst onto the scene with Memento, a film which was backwards leaving the viewer’s brain fried, he also revitalized the Batman series with Batman Begins. In 2008, he made The Dark Knight, which was arguably the best film of the decade, and became the third highest grossing film of all time. But how could Master Nolan possibly top his success in 2008 with The Dark Knight? Easily. He releases Inception, a movie which he wrote, produced and directed himself, and managed to fry our brains again...and also restored everyone’s faith in the modern blockbuster. So what’s Inception about? Well, it’s best if you just go and watch the movie, because it would take me at least three pages to explain the whole plot so you don’t get confused. I’ll give you this, though: Inception is a movie about people who can go into your dreams and steal your ideas. However, Cobb (Leonardo DiCaprio), the most skilled ‘extractor’, is given the task of planting an idea instead of stealing one. There’s no doubt that Inception is the film of the year. When I first saw it back on it’s opening day in July, I had never seen anything so beautiful, so challenging, so completely creative. I also managed to walk out of the cinemas in tears thanks to how amazing it was. Take it from me, I saw it three times in the cinemas (record), and loved it every single time. And I’m pretty sure the six friends who I took to see it all loved it too. Why is Inception so great? It’s unprecedented amount of originality. I have never seen anything come close to this film, apart from maybe The Matrix. Inception is a multi-layered action packed thriller, which requires your full attention. If you take your eyes off it for a minute, you are guaranteed to miss something. But trust me, this is an easy film to lose yourself in, which makes it all the more satisfying at the end. The rotating hallway fight sequence that Joseph Gordon-Levitt finds himself in is awe-inspiring, as are the scenes where we see Ellen Page picking up the dream world by folding over Paris. It’s not only a visually stunning piece, but it is also an emotional one, too. The more we find out about Cobb, the more we care about his plight to get back to his family. Most of all, the end is possibly the best and most-talked about ending in recent history, but it also caused me to wonder about the line between reality and dreams. I felt like I dreamed I had seen Inception, because it’s sometimes too good to be true. Inception has a wonderful ensemble cast. It has the relatively well knowns: a great Leonardo DiCaprio, a beautiful Marion Cotillard, a brilliant Ken Wantabe, even a couple of appearances from Nolan’s lucky charm Michael Caine and Tom Berenger. The rest of the cast is made up from some young actors who are equally as brilliant as the others: Joseph Gordon-Levitt, Tom Hardy, Cillian Murphy and Ellen Page. Basically, with a cast like this and a director like Nolan, Inception is a dream. If there’s one movie you see this year, make it Inception. Unfortunately, it has been proved that the older generation don’t like it, but the younger generation will LOVE it. This is more than your brainless blockbuster. Christopher Nolan, again, has raised the bar in movies with Inception, and if he can top this with The Dark Knight Rises in 2012, then it will become clear that he is the best director who ever lived. Come Oscar time, Inception will be in for Best Picture, Best Director and Best Screenplay, no doubt about it. THE VERDICT: The movie of the year. The greatest blockbuster in recent memory, an example of why Christopher Nolan makes the best movies. 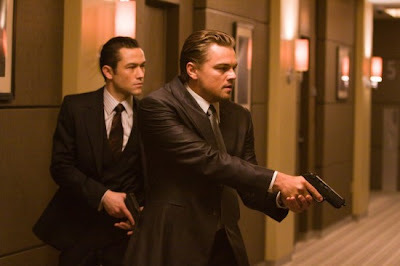 If you want to watch a movie that makes you think, then Inception is the grand-scale epic you should watch. I found a mistake in your review. Too bad... It must have been 11/10 :))) Anyway, I had made the same mistake earlier giving it 5 stars out of 5, but it deserves more. Oopsie...I knew I underrated it! Thanks...I thought it was time for a change. I'll miss the 'dream a little bigger darling' too, but who knows...it could come back in the future!